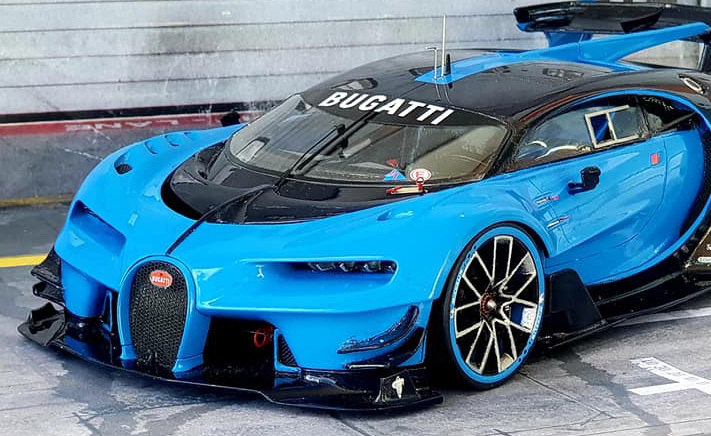 1:24 Bugatti VGT full resin kit. More detail pictures for Blue colour version. See more at Alpha Model. Only a timorous incursion into car modelling: 1:24 Ford model T – “Firetruck”, ICM kit. I really enjoyed making this model. Hope you like it too. This is a 1/48 Fire Brigade Models Aerial Ladder Platform that comes as a complete multimedia kit. There are many parts to it.That is a resin body and jib ,aluminium ladders ,chromed accessories, jewelled lights, rubber tyres and pipes,brass etch and white metal parts. And with a full livery decal sheets.Not really for novices as it does test your abilities throughout the build. Can be a little fragile but very satisfying to actually reach the end of the build. Just finished this model, the Alfa Romeo 6C Mille Miglia 1930. Made from the Airfix 1:24 scale kit – hope you like it? A few pics of the latest project I completed around 5pm tonight. It’s the Tamiya 1:24 scale Aston Martin DBS as seen from the opening sequences of the Bond film “Quantum of Solace”. As you can see it required a “rebuild”. 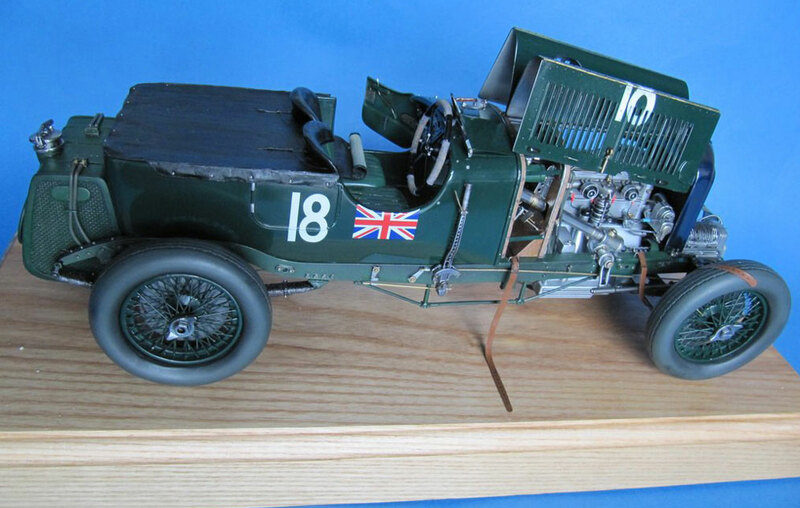 All the best, Ian R.
The Bentley modelled is that of the ‘Blower’ driven by ‘Tim’ Birkin in the 1930 French Grand Prix at Pau in which he finished second. During my research I discovered mistakes in the myth and legend surrounding this car. On the Airfix box it says that the kit is of Blower No.2, but the text is incorrect. No. 2 was indeed Tim’s car, but this was not the car in the French Grand Prix as stated on the box. Blower No.2 had been seriously damaged a couple of weeks earlier in the Ulster Grand Prix and attempts to repair it failed to meet the French Grand Prix deadline. Blower No. 4 was hastily stripped and prepared for the race. The second myth that came to light was that Tim Birkin was the only driver – ever – to have used the horn in a ‘Formula 1’ while overtaking another driver. Close examination of the reference pics show that the horns had been stripped from the car prior to the race along with the headlamps and the wiring taped to the chassis which I have reproduced. I started the kit two years ago and finished it three days prior to SMW 2015. There is no aftermarket available for this kit which resulted in over 60 scratch built parts and conversions, the major ones being lead sheet used for the tonneau cover, re-spoked wheels, brass sheet passenger door, re-upholstered seats with Milliput, home mastered resin tyres and a wooden veneer floor. Paints used were Zero and Alclad2 with Miracle Masks used for the numbering. On opening the kit I was amazed at just what was in the box, a truly remarkable multi-media kit from Tamiya. The kit was a dream to assemble, parts almost clicked together, screws held parts of the engine and side panels. Pipe lines, screws, decals, clear parts and a lot of sprue parts and even a real spring; the quality and state of the art manufacture is noticeable in this kit. The front screen is just held in by a click – no need for glue. The only mod I made was to drill out all the holes in the brake discs. I thoroughly enjoyed making this kit and can say it’s one of the best kits I’ve made in a long time. This is my Tamiya Ducati 888 Superbike Racer. Used Zero Italian Red with two part clear, and polished. Fun build, no issues with fit, although regrettably some parts lost, despite trying to ensure when cut from the sprue they didn`t fly across the room. Used Zero White for frame and mainly Alclad 2 paints for engine etc. One issue with front white decal, despite cutting and use of Micro Set and Sol decal softening solutions, I just couldn`t get it to sit properly, so gave up and simply used the number 9. Also first time used carbon fibre decals, on next use need to avoid overlap, less forgiving than kit decals. As F1 cars has been my main area of building for a number of years I thought I would send you some pictures of the Tamiya 1:12 Ferrari 312T4 I finished just over a year ago. The kit is an original 1980s release so now well over 30 years old but in true Tamiya style still holds its own. At 380mm long it’s an impressive build and with full engine, gearbox and cockpit detail it builds into a fantastic replica straight out of the box. The only aftermarket parts used were yellow tube to replace the clear fuel lines provided in the kit and a set of new decals due to the age of those in the box. Painting was done using Alclad II paints for the engine block and chassis with Zero paints 1980s Ferrari Red for the bodywork and Zero Clearcoat to seal in the decals. The wing elements are the kit chrome parts with a coat of Zero clear. Decaled up as the No.12 car driven by Gilles Villeneuve the 312T4 is one of Tamiya’s best big scale F1 cars full of detail and a joy to build. 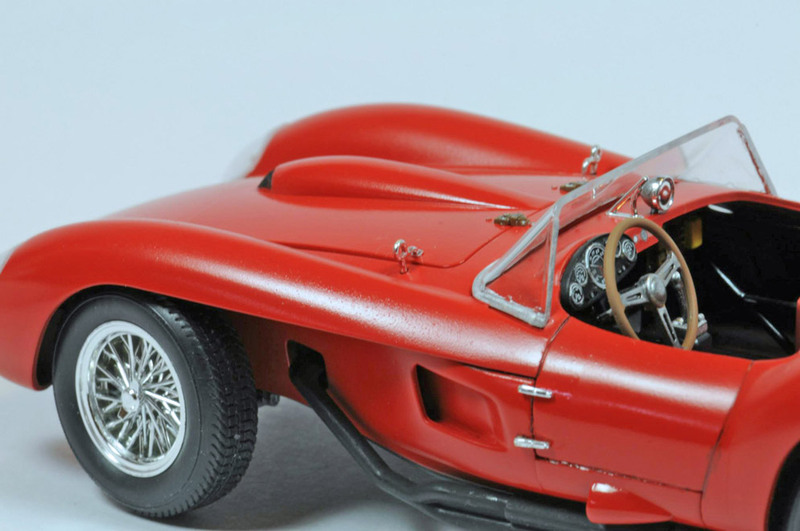 Here is my Ferrari 250 Testa Rossa in 1:24 scale and made from the Hasegawa kit. Here is the Zvezda GAZ M1 ‘Emka’ which I completed a month or so ago. I have to say this is the best soft-skin kit I can remember building in a long time! They got the balance of detail and buildability spot on. The wheels are resin from Minor. 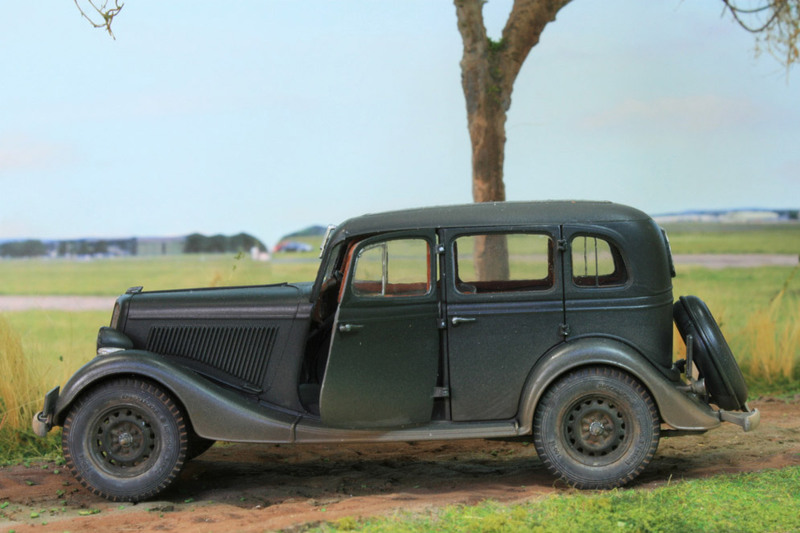 The Gaz M1 car was a licence built version of the 1934 Ford Model B car. Powered by a 49 HP 3.3 4 cylinder engine. The Russians upgraded the vehicle with stronger suspension and wheels to cope with ‘Stalin’s asphalt’. Private motorists did not exist in the Russia of that time so they were for the use of officials, the military and the notorious NKVD. 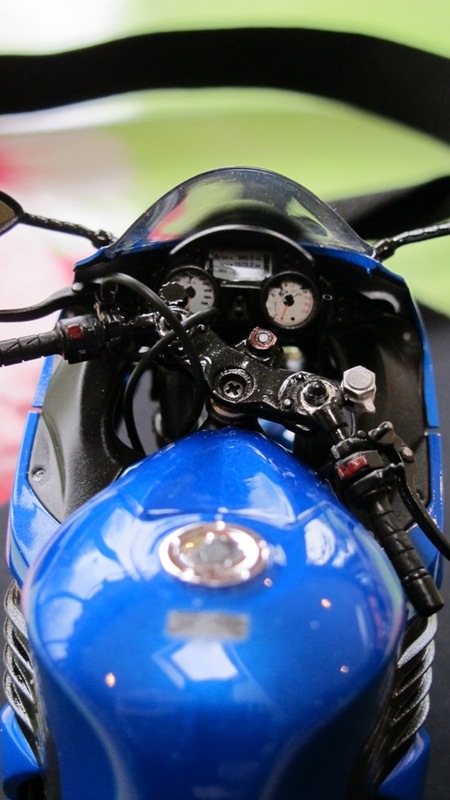 Here’s my 1:12 Kawasaki ZZR1400 using the Tamiya kit. I used Zero Mica blue and Clear; polished with polishing kit and Tamiya compounds; no after parts, straight box kit. Last time I completed a motorcycle was probably 30 years ago!! The first time that l ever saw the Veneno was only about two years ago and l was surprised to discover it had been built in 2013. Depending on which references you read either 5 or 9 were built, at a price of around 4.5 million dollars! The model shown here is produced by Fujimi and retailed at around £30. As is obvious by the images, the finished car is the Roadster version whereas the kit is of the roofed version and this meant that a fair amount of scratch building was required. Luckily the kit came with a fair representation of the 6.5 litre V12 engine and the complete rear engine as a separate part. The first task was to cut the roof off of the main body, this part became very weak and flexible due to the fact that only the sills under the non-existent doors held it together. From here, the kit was built virtually straight from the box; details and colours being found on numerous web sites and You Tube. 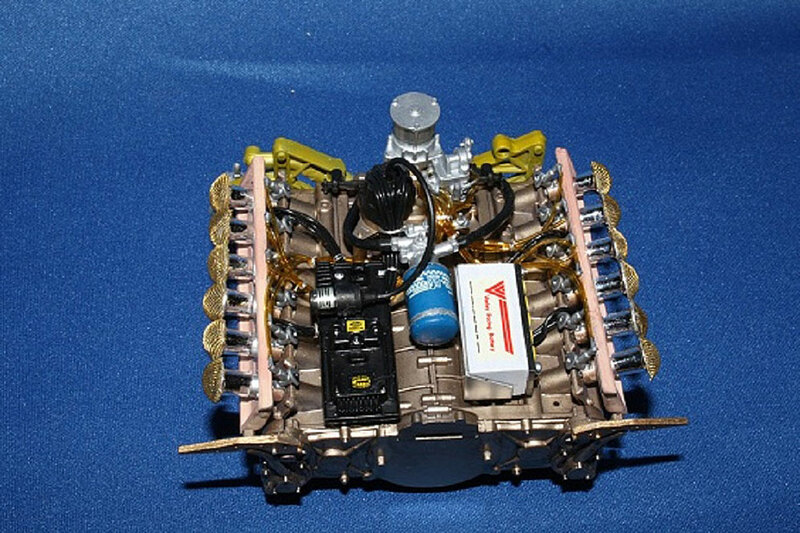 Construction of the new lowered engine deck was by using various thicknesses of plastic card and Milliput. The most challenging part was building the twin roll over structures that wrap around the seats. At no time were any sketches or plans drawn, the whole build being done by eye until it looked correct. The central fin and airbox was made in the same way and blended in with filler until smooth. Many of the You Tube videos show a Veneno in a metallic red colour, so thats what l went for, Tamiya TS-18 as it’s virtually an exact match. The body was spayed outdoors in warm sunshine straight from the can until a smooth finish was achieved. after leaving a week to fully harden, the finished body and doors were attached to the chassis. The final parts to add were the door glazings that meet the windscreen at the A pillars. This project lasted around 3 months and was the most involved car conversion I have done and I’m pleased with the way it turned out and a thoroughly enjoyable project. Today it’s time for something different: a Formula 1 car. This is the 1:20 scale Tamiya Leyton House from the early nineties. The kit was mostly built straight from the box with some extra detailing in the engine compartment. All black parts are Alclad primer and the exhaust Alclad metal paints. The body colour was painted with a spray can from Tamiya, which is really great stuff. The green and white areas and thin black lines were masked and airbrushed. Hope you like it! René VDH. The car is a Revell kits 39 Chevy Coupe Low-rider and built straight from the box. It is painted in Humbrol Red it was a nice little kit to build for a bit of fun. This is the Kit Form Services 1:24 resin kit of the Michigan L190 Shovel Loader built out of the box (although there are scratched elements the materials are supplied). My intention was to build, paint and weather as a vehicle that had spent its entire working life outside at one location (quarry or such like); serviceable but little regard for cosmetics. (plenty of online references showing vehicles in that state). Primed and under coated with True Earth rust primer given a couple of coats of AK’s worn effects (I prefer this one because it allows you to wear through the paint colour without knocking off too many large lumps). Yellow was MR Color acrylic yellow and overall weathering using weathering products and pigments from both AK and Ammo. This is Revell’s Peterbilt 359 model truck – the scale is 1:25. Some of its parts are snap parts, but nonetheless this model is a great model to have and it’s my second Peterbilt 359 model. I used Krylon spray-paints for model kits, as well as Testors enamel paints and marker pens. Some decals came from other truck model kits, mainly from AMT’s Peterbilt 352 Pacemaker model kit. The model was shot in natural lighting with a Nikon D7100 DSLR camera. The interior of the cab is tan, the seats are gloss black and the silver parts were painted using Sharpie’s silver pen. This is my Tamiya Renault Alpine a110 – I used Zero Alpine Renault Blue and Zero clear; bare metal foil on windows. This is the Kit Form Services 1:24 resin kit of Tracked Excavator; it is a generic vehicle very similar to a Caterpillar Excavator but different enough to not contravene copyright! It is a very comprehensive kit, which I built out of the box (although there are scratched elements the materials are supplied). My intention was to build, paint and weather it as a vehicle nearing the end of its working life but still operational; serviceable but little regard for cosmetics. (plenty of online references showing vehicles in that state). Primed and under coated with True Earth rust primer and given a couple of coats of AK’s worn effects (I prefer this one because it allows you to wear through the paint colour without knocking off too many large lumps). Here’s my model of the Volvo F12 in 1:24 scale made from the Italeri kit. The Bike started as a Tamiya kit of the Yamaha R1 with the fairing removed and some new handle bars fitted and a new head light. The paints used for the tank and other panels are Tamiya Silver then sprayed over with Tamiya Clear Orange and Clear Yellow. The figure is from the Legend range and painted in oils and Humbrol paints.